Things would get rowdy, as you would imagine, but the sailors from the RAN took the cake – there are photographs of men on the roof of a public toilet in a Bugis Street alleyway, with something alight sticking out from their naked buttocks. 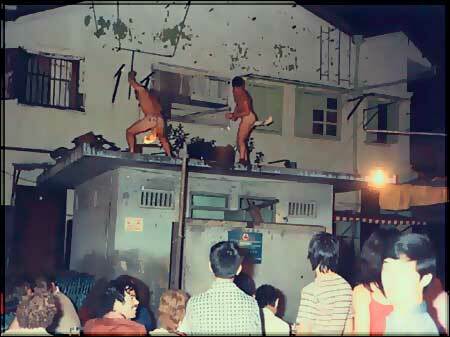 Back in the day when Singapore was an unruly sailors’ town, Bugis Street was a thriving collection of bars, Zhi Char stalls and transvestites, all vying for the custom of thirsty, hungry, and horny military men on shore leave. Things would get rowdy, as you would imagine, but sailors from the RAN took the cake – there are photographs of men on the roof of a public toilet in a Bugis Street alleyway, with something alight sticking out from their naked buttocks. This stunt was practiced in various ports of call, and was called The Dance of The Flamers, or The Dance of The Flaming Arseholes. The steps were simple: The sailors who volunteered to entertain everyone else simply had to strip naked, find a rolled up newspaper and kiap it between their buttock cheeks, and set it alight. Then he simply had to walk from one end of the stage to the other without dropping the buttock torch. These days, visiting sailors seem much more restrained, while other types of tourists let their children defecate on the floor of cafes in our shiny integrated resorts.